The new build 77 metre Project NB 63, which was being built on spec by Turkish yard Turquoise Yachts for delivery in 2018, has been sold with Burgess introducing the buyer. Project NB 63 is the latest collaboration between Turquoise and H2 Yacht Design and is an evolution of the 2012 award-winning yacht Vicky. It takes inspiration from its older sibling’s sweeping lines, which have been further refined to include a stretched arch that runs around the aft of the yacht. The sundeck of Project NB 63 offers wide views of the seascape, a large sunbathing area and a five metre swimming pool with a waterfall. The lower deck has a beach club that opens on three sides with a bar and loose furniture, allowing the space to be used for a number of functions. Midship on the lower deck is the tender garage, which can accommodate a limousine tender of up to 10 metres and a multi-purpose tender up to eight metres. There is also space for jet skis and wave runners, as well as a dive store. 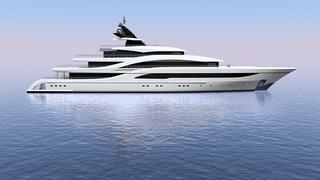 Project NB 63 can accommodate up to 18 guests in nine suites, some of which can interconnect. The 100 square metre owner’s suite offers panoramic views over the bow, and also has its own private exterior area forward. There is a smaller cabin for children or staff on the same deck. The other guest suites are located forward on the main deck, with large hull windows. Between 2005-2011 Burgess has worked with Turquoise on four new build projects and this marks the fifth such collaboration.